﻿Mark the dates in your calendar and spread the word. The IGHS annual meeting and symposium for 2018 will be returning to Northeast Indiana on March 16th and 17th. 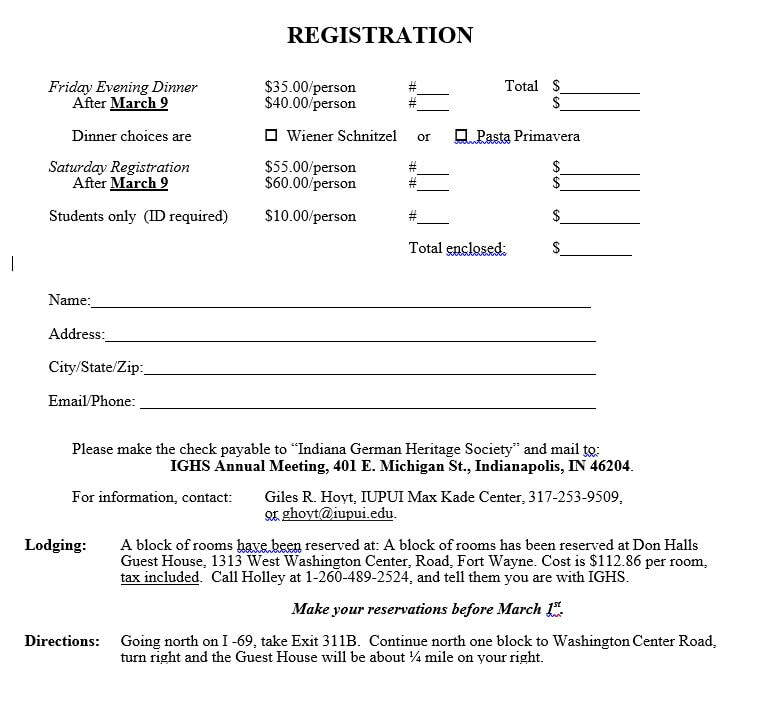 The 34th ANNUAL MEETING AND SYMPOSIUM will be presented by the Indiana German Heritage Society in cooperation with the Friends of Wyneken. This year's topic is “F.C.D. Wyneken and the Lutherans in Northeast Indiana"
For questions contact Dr. Giles Hoyt at ghoyt@iupui.edu. The Concordia Theological Seminary is located at 6600 North Clinton Street. Turn right out of the Guest House parking lot and proceed through five traffic lights to Clinton Street, then turn left. The entrance to the Seminary is about ¼ mile on your right, hidden in the trees. Seminary parking instructions and directions to Luther Hall will be available at the Hotel. 7:30 a.m. Bus leaves Don Hall’s Guest House. Guests will need to check out prior to departure, unless you are staying Saturday night. 8:00 a.m. Visit the Wyneken House for full catered breakfast and Wyneken House tour. 10:15 a.m. Proceed north to Country Heritage Winery, for a tour and/or tasting and purchases. 12:00 noon Head to the historic St. James restaurant in Avilla, Indiana for lunch. Lunch choices are broasted chicken or cod, with all the trimmings. (Alcoholic beverages and tip are extra). 1:30 p.m. Tour the historic 1844 Immanuel Lutheran Church, a congregation organized by Rev. Wyneken in Avilla for a tour and history lesson. 2:45 p.m. Proceed to the Zion Lutheran Church in Corruna, an 1851 congregation organized again by Rev. Wyneken. This is the original clapboard sided church, where we will have a tour with history, and snacks following. 4:30 p.m. The bus heads back to Don Hall’s Guest House, arriving approximately 5:00 p.m.